➤3.5mm AUDIO JACK COMPATIBLE: These headphones are compatible with any device with a 3.5mm audio jack, including iPhone 6 and earlier, Samsung Galaxy, and Google phones. 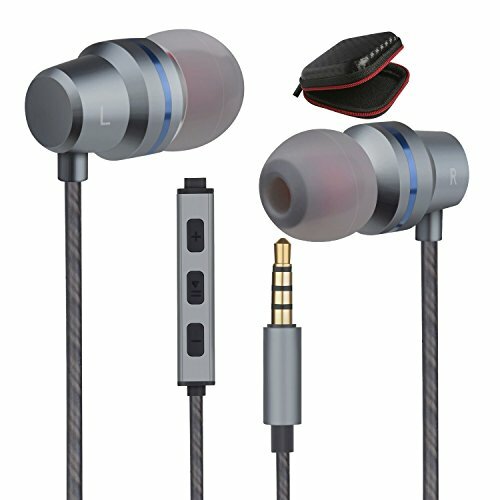 ➤How to use these earbuds with remote and microphone? →One click: Start/Stop the music. →Long press: decline call/Start Siri. which can isolate outside noise with highly qualified sound insulation effect. ➤Compatibility iPhone, iPod, iPad, Android Smartphone and Tablet, Windows Smartphone and Tablet, MP3/MP5 Player, PC Computer, Notebook and many more portable music players. ❤The earbuds was built in a in-line controller and a high quality microphone, The built-in microphone enables convenient remote control for music play and phone calls,wired headphones guarantees clear and smooth hands-free communication. the earphones controller was designed to play / pause music / next track / previous track / answer phone calls / hang up phone calls. ❤Ergonomic in-ear Design:Wired earphones with 3 sets of different soft silicone earbuds tips ensure a proper fit and extra comfort Lightweight and Advanced design ear buds make maximum comfort and fashion. and the soft and flexible silicone in ear tips enable it to fit and stay in ear perfectly avoiding Sliding out. ❤What you get: 2 pairs eartips in different sizes and 1 earphone; 1 year free warranty and 24 hours online customer services.We devote ourselves to provide the best customer service and bring the best earphones shopping experience to every customer.If you are not satisfied with our ear buds.just contact us and we can offer a full refund or replace with new earbuds to you. NO questions asked! Please contact us if you have any questions about Gsebr earbuds. If you have any questions about this product by Gsebr, contact us by completing and submitting the form below. If you are looking for a specif part number, please include it with your message.